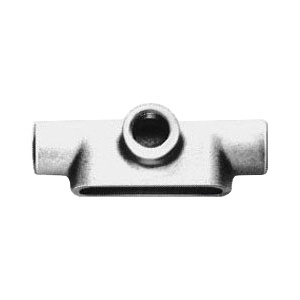 Crouse-Hinds Condulet® Form 7 type T conduit body of trade size 1-1/2-inches, protects and routes the conduits through three tapered threaded hubs placed in tee shape. This conduit body in epoxy powder coated finish, features copper-free aluminum construction. Conduit body with 26-Cubic-Inch capacity, offers side access to the conductors for maintenance and future system changes. It has a dimension of 8-3/16-Inch x 2-9/16-Inch x 3-9/16-Inch. This NEMA 3R conduit body comes with snap tight and wedgenut cover to safeguard the conduits from physical damages. It has a bend radius of 1.9-inches. This conduit body provides openings for making splices or taps in conductors, connects conduit sections, makes 90 deg bends in conduit runs and acts as a pull outlet for conductors being installed. It is suitable for rigid conduit. Conduit body is UL 514B listed, CSA 22.2 No. 18 certified and meets Federal Specification W-C-586D standards.